Is Your Culture Friendly to Change? Over the years, this line of questioning is hands-down the most common in my culture change workshops. It applies to all change, not just cultural change. During any change (small or large) in any organization, of any size … there will be a group of people who are totally committed, excited, ready to lead, and have been waiting for their leader to start the ball rolling and organize it. On a standard bell-curve, maybe 5-10%. There are also a group of people who pull against anything you do as an organization to improve things. The Debbie and Doug Downers in life. They spend the majority of their life energy throwing darts at everyone else’s ideas and efforts. Those are probably 5% of the organization, truly. But they are acting up in ways that make it seem like they’re 80%! And then, there are a whole bunch of groups in between. Like any standard bell curve, that’s probably 80%. People who want change but are afraid to hope in case they’ll be let down. Those who prefer to wait and see whether their trusted colleagues and their boss is bought in. Those who have been disappointed so many times with false starts and flavor-of-the-month programs, and are sure this one will end up in the same recycling bin along with the other programs. And, those who have been in the organization a LONG time, are irreconcilably burned out and need to move on. With your initial group of Committed Champions …Noisy is the key. As you properly engage these people in the movement towards change, you will start to see people in the next wave, come on-board. 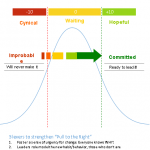 (This happens only if you carefully select Key Influencers in that initial round – positive role models that people look to and say “Wow if she is involved, then it must be a good thing.” Throw in a few “grumpy geniuses” – people everyone knows are somewhat against the change but are not actively and noisily on the bandwagon to derail it. A few of those people can provide a LOT of credibility. As you gain momentum with communication and visible changes – people adopting new habits and others seeing the benefit of those habits – the wave starts to create a magnetic pull to the right. The people on the left end of the continuum are drowned out by the positivity. Their voices are harder and harder to hear. They become more isolated. Eventually, they self-select out, or are asked to leave. People in the middle, start to feel it’s real. This is not an overnight process, but it is a dependable one. 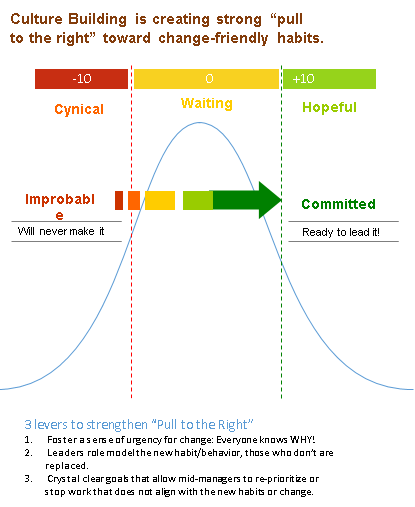 Most organizations spend far too much time trying to leap-frog people on that left side of the curve, towards commitment. It’s like pushing a 2-ton boulder uphill – possible, but really is that the best use of your energy? Maybe that’s why wheels were invented … ! Like water flowing downhill, this creates a natural process of flow in an organization, where change starts to take hold because it feels right and good. Almost always a better approach than trying to convince water to flow upstream.